Are you tired of buying clothes that disintegrate after only a few seasons? How about expensive coats that look great but are only appropriate for a month or two out of the year because of changing weather? You can banish these problems when you invest in a beautiful shearling coat from D’Andre. Our shearling coats are not only some of the highest quality coats on the market, they also adapt to changing temperatures. That makes them appropriate outerwear from fall into deep winter and back into spring. You can wear shearling coats virtually all year long because they are made of sheepskin. Shearling is a natural material that allows for breathing of the skin beneath it and possesses insulating properties. When used as a coat, it functions in much the same way as it does for sheep, which means you stay cool in the summer and warm in the winter. This makes it the ideal coat if you’re searching for something that is versatile and long-lasting. Imagine not needing to pack several coats when going on business trips or traveling through varying climates. Imagine not over-stuffing your bag. Imagine being able to come right off your plane and not being sweltering hot or freezing cold. With all the styles that D’Andre offers, the perfect shearling coat for you is waiting in our catalog. With traditional coats as well as modern styles, we have something for every discerning taste. However, no matter what style you choose, you’ll know that your coat will be high-quality, beautiful, lightweight and perfect for any weather. 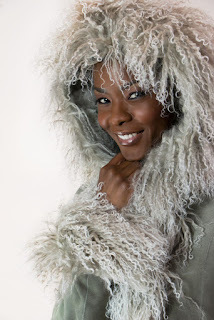 If you have questions about D’Andre or our exquisite collection of shearling coats, give us a call at 1-800-564-4168. Our customer service representatives will be happy to assist you. The mass-produced coat has its place. Some people want the low price tag, and they don’t mind the synthetic materials. But what about those of us with more demanding tastes? If human innovations pale in comparison to Nature’s grandeur, why settle for something thrown together in a factory? A luxurious shearling coat offers the ultimate in Nature’s perfection—all in a comfortable, stylish package. Shearling coats are the original climate control technology. Wool is designed to wick moisture away from the animal’s skin, keeping body temperature cool and regulated. Luxurious shearling outerwear provides you with the same incredible temperature moderation keeping you warm in the coldest temperatures. Natural, functional climate control isn’t all that a shearling coat offers. The subtle beauty of wool is naturally amenable to the highest standards in fashion. Top designers work with shearling, bringing a range of tasteful accent styles to Nature’s elegance. Yet in all our shearling designs, form follows function. A shearling coat is the ultimate winter wear staple. Our shearling jackets are created at the nexus of practicality and refinement. You’d be surprised at how well shearling outerwear walks this line. Human history is a history of innovation, and today’s world displays that lineage. With communications sent across the globe in a matter of milliseconds, you might say that humanity has achieved the ultimate in sophistication and efficiency. Yet with all that innovation, we’ll never top some things. The Grand Canyon will always surpass the greatest of our achievements in sheer beauty, and no app can convey the staggering beauty of the aurora borealis. For every incredible innovation we come up with, Nature shows us her timeless beauty—a cohesive system of incredible function and complexity. With practicality, you want individuality. Our shearling jackets offer this, too. No two shearling designs are alike. Subtle, refined, yet unmistakably original, every coat we offer connects elegance to functionality to durability. At D’Andre New York, our extensive catalog of luxurious shearling outerwear has something for every taste. Shop today, and experience the timeless beauty of shearling.